The Christmas holidays, or the idea of them. Decorating my phone. Sometimes I think I like the idea of the Christmas holidays more than the holidays themselves. My ideal Christmas is very, very low key, with no stress. You do what you want in your own home. If you don’t like a tradition, you don’t do it. If you don’t care for an event, you don’t go to it. And of course there is no snow or ice or humidity or dampness. Snow or cold or ice does not mean “Christmas” to me! I miss being in my home in my California. Hawaii would be great too, for the Christmas holidays. In Hawaii the humidity would be worthwhile. I do like seeing the Christmas lights outside, on the houses and the streets. And I shop in stores so rarely (online for me!) that when I do, seeing all the holiday “stuff” is rather festive and charming. I am glad to be of help to my family and I’ve (mostly) accepted the fact that I’m not in California. And the job scene is looking up – it might be very soon that I have a job! Speaking of holiday decorations, I never planned to buy this, but I saw it, and then it was in my hands and I was at the checkout station. 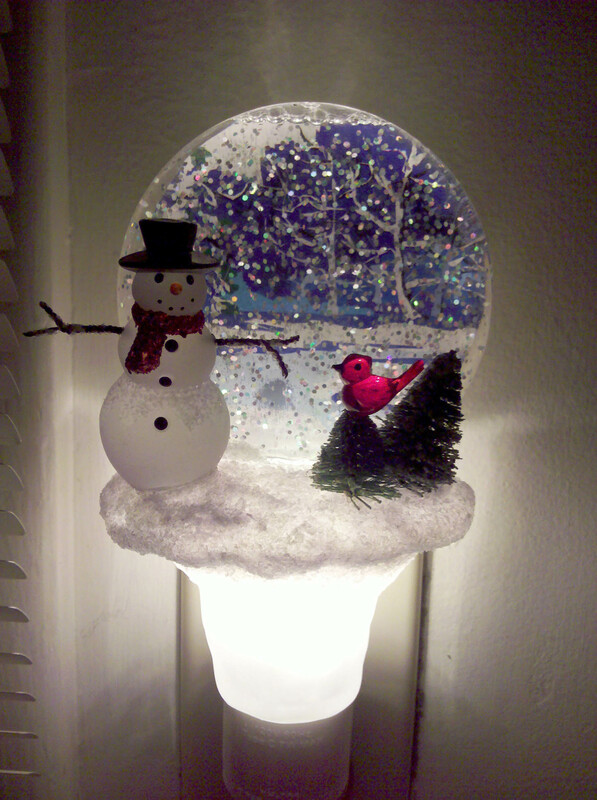 It’s a combination night light and snow globe. It’s nicely designed. The small amount of heat from the light bulb makes the glitter in the sky move, slowly. It’s like a snow globe, but I don’t have to shake it. Isn’t it wonderful? I decorated my Motorola Droid, my Android OS smartphone, for Christmas, with the Christmas Tree Live Wallpaper, http://www.1473labs.com. The picture appears on all the screen displays on your phone – my phone has five screen displays. The snow falls and the lights twinkle. On one screen I added a widget, Christmas countdown. Christmas countdown displays a little image and the number of days until Christmas. There is a different image for each day of the week. The wallpaper shows up behind all the icons you have on your phone, the apps, the bookmarks, the folders. I kept one of the screens of my phone free of icons, so I could look at the wallpaper and the Christmas countdown, all by themselves. Before I had my Motorola Droid, I used to play fun little games on my Palm TX, a pda, personal digital assistant, like a smartphone but without the phone part and without the internet. There was a Christmas game I particularly enjoyed, a game where Santa dropped presents, and you had to catch the presents with a cart (or a sleigh, can’t tell). It was a sweet little way to pass the time. 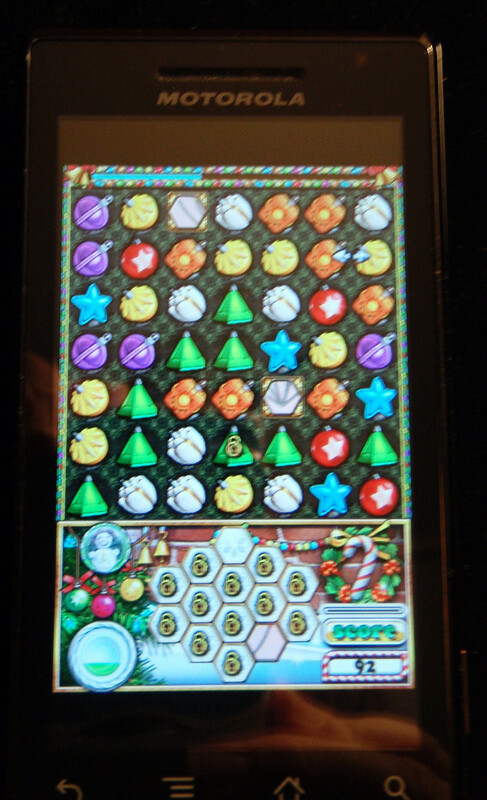 I haven’t found that game, but I found a Christmas version of a game similar to Bejeweled, called jewellust Xmas, http://www.smartpixgames.com. Like Bejeweled, you manipulate the icons to make at least three identical icons in a row. They then go away, and the icons above them roll down. In this game, your goal is to collect all the mosaic tiles on the screen. You collect them when you get them to roll off the screen. The mosaic tiles make a picture. You have a limited amount of time to collect all the tiles for each picture, but it’s not that hard. This version of jewellust is Christmasy. The icons make bell like sounds when they drop. The “three of a kind” icons look like ornaments. There are candy canes and Christmas scenes. If you play in Campaign mode, after you complete a level and fill a mosaic tile picture, a Christmas village is displayed, with a line in the snow as you go from one house to the next. It’s just a line; you have to imagine yourself in the picture! There are also simple tile puzzles to solve, displaying Christmas ornaments. I love this game. It’s a wonderful way to give yourself a little holiday break. Jewellust Xmas on my Motorola Droid phone, November 2010. Happy Christmas holiday preparations, if that’s your thing.